Malcolm Ginsberg, editor in chief of BTN, was once many years ago press manager at Lotus Cars. As such he retains an interest in motoring affairs and while Ted Wilkinson, a member of the Guild of Motoring writers, is the senior member of the BTN car test team, Malcolm is allowed from time to time to get his hands on various models. MG’s review of the Kia Picanto follows Ted’s full road test of Skoda’s latest Superb. Skoda is really on a roll, a competitive range of practical and interesting cars with a strong reputation for customer satisfaction which is now hitting the big time with the recently launched third generation version of the flagship model the Superb in hatch back and estate form. I earlier wrote a praiseworthy test on a diesel powered estate model and now I look at a petrol powered hatch back version. What immediately hits me is the generous interior proportions of this certainly sensibly sized but commanding looking car and the impressive driving performance achieved by a mere 1.4-litre turbo engine driving through a six-speed manual gearbox. It is mechanically quiet, very smooth riding with ultimate feel though the controls yet so responsive to all driver commands and rather nippy thanks to the 148 bhp power of the willing engine. Obviously performance does depend on how much the car is loaded, this car will take five large occupants in high levels of comfort, the rear space providing exceptionally generous and the luggage capacity, surely class leading. Skoda claims a top speed of 137mph with 62 mph acceleration from rest in a very competitive 8.6 seconds. The combined fuel consumption is 57.7 mpg and looks more attainable than some official Government test claims I have encountered over the years, the fuel gauge needle seeming to be stuck on full for ages! I suggest that 40 mpg should be easy under mixed driving conditions. Importantly, the intermediate acceleration is responsive, especially when picking up from say 50 mph to 70 mph under motorway conditions, indicative that what seems a small capacity engine is immensely smooth and with more than reasonable flexibility. Add to that a very comfortable driving position, good forward visibility though rear vision relies a lot on the exterior mirrors as the rear window is a bit high and very rakish – there is no rear wiper and the test car did not come with a rear view camera, rear parking sensors are there to re-assure however. The interior appointments and trim and body finish are to the highest standard yet seen by a Skoda product. Accepting most of the usual bits of kit, on this test car there are heated front seats, optional Smartgate technology, eletro-mechanical park brake, cruise/speed control, multi-collision avoidance system with auto hold, a remote powered opening/closing tail gate, touch screen Bolero audio system, cornering fog lights, tyre pressure monitoring system and a few practical items such as a pair of umbrellas, a rechargeable torch in the boot, an ice scraper inside the fuel flap and a parking ticket clip on the front windscreen pillar. A welcome option at £100 is a sensibly sized get you home spare wheel at £100 – much cheaper than some other makers have quoted! I undertook quite a few journeys with different occupants the common word included in their glowing comments was “unbelievable”. 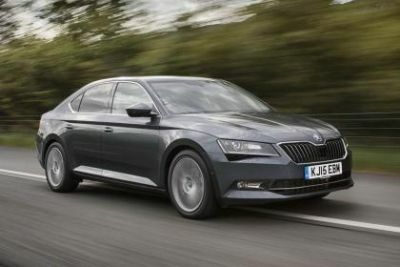 Well, as I write this test Skoda report the Superb model has been short listed in the top 10 contenders for the World Car of the Year title. That’s more than a bit serious! The modern Kia company really dates from 1998 when Hyundai acquired 51% of the company, outbidding Ford who had owned an interest since 1986. Today the investment has been reduced to 33%, but it is by far the largest shareholder. The Picanto city car was originally launched in 2004 and is now what is called “second generation” introduced in 2011 and the latest version of the Picanto 4 includes an optional sat/nav, reversing camera, plus electric folding mirrors, sun roof, heated front seat and steering wheel and full air conditioning. It has a quality feel about it and being only 62.3 inches wide and 139.2 inches long is capable of parking just about anywhere. It comes with a seven-year guarantee with very competitive pricing. There are both three-door and five-door models available and the rear seats are surprisingly spacious and fitted with belts for three. In such a small length the boot is restricted but the back rests fold down giving ample storage space if needed. The Picanto 4 test car buzzed along very nicely at 75mph aided by cruise control and speed limiter but if you are going on a long journey, and fast, 42.5 mpg is all you can aim for, accompanied by a mean fuel tank only holding seven gallons of petrol. I also a tried Picanto 3 automatic version with sat nav and reversing camera from a local dealer and found this to be just as acceptable, even on the motorway, and ideal for in town. No sun roof, folding mirrors, smart key and start/stop, privacy glass or the cruise control on the '3'. This sells as a city car. The six-speaker radio is very easy to use and the steering wheel controls are neatly laid out, worthy of a much more expensive car. From a safety point of view the rear view mirror covers the whole of the large back window. The interior is well-ordered with a bottle holder and space for bits and pieces plus a seat back pocket and USB and auxiliary ports. It has a smart key with engine start button, speed sensitive locking and a stop/start engine control for those who like that method of reducing fuel consumption. From a safety point of view there is a hill start assist control (no rolling back) and a brake assist system which claims to reduce the stopping distance during sudden braking conditions. There is something called electronic stability control (ESC) designed to help when you need to brake or swerve suddenly. I find it outstanding that offerings once the preserve of very expensive automobiles can now be found in what is truly an economy, but quality range of cars. With the 1.25 ltr five-speed gear box don’t expect to win the traffic light grand prix and the gear ratios are such that you need to keep the revs up for performance. 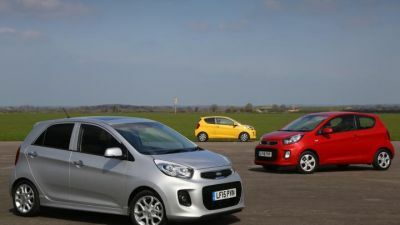 The Picanto 4, as tested, is priced at £11,795 on the road. The Picanto 3 is £11,745.